The next instalment of the Roads to Ride series is the Col d’Eze that climbs out from the city of Nice, France’s fifth biggest city. 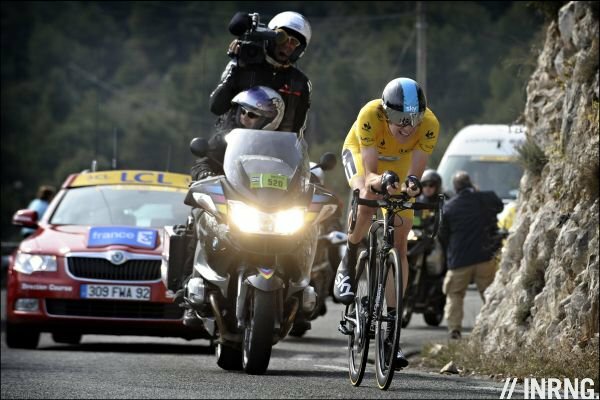 It’s a climb that’s been made famous by the Paris-Nice race since it was included in 1969. If Sunday will see the road closed and dedicated to cycling, then on a normal day it’s busy road that links Nice to the hills above, a ramp to climb high above the rooftops and escape the noise of the city. For the next week this climb and the roads between it and the Poggio just over the border in Italy become the centre of world cycling. 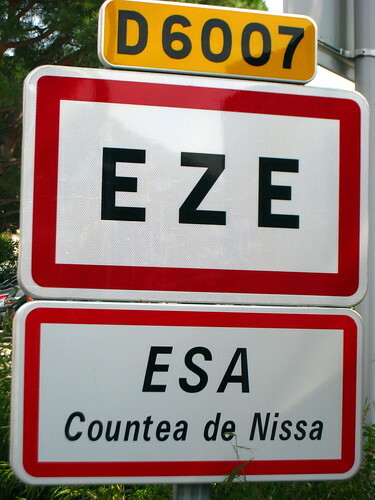 The Col d’Eze is a pass and as fits the palindromic name, you can ride up Eze from both sides. But the Nice side is the famous part. It is 10km long and averages 4.7% but has long sections of 7-8%. It starts as the Bouvlevard Bischoffsheim. The D2564 climbs out of town rising above the railway, heading north before bending around the Mont Gros hill and its astronomical observatory to head back south and cross the Col des Quatres Chemins then climbs east by north-east to the village of Eze. The gradient bites right from the start as you climb north out of Nice. Villas line the road on the right, the fronds of palm trees a useful guide to the wind speed. Traffic’s not as bad as other parts of Nice but there’s an urban vibe, more than another road in the series so far. Cars pass fast, scooters buzz like hornets and the metallic noises rise from railway yard below. But within two kilometres things change as the villas get bigger, the vegetation denser and soon you leave the city behind. In no time the buildings stop, replaced with the wild oak and pine forest and it’s here that the gradient eases too. The road bends round and heads back south towards the coast. The buildings return as you cross the Col des Quatres Chemins, the “pass of fourth paths.” Up and up and the gradient eases just before you reach the village of Eze, the destination of the road from which the pass is known. This isn’t a magical climb, there’s no communion with nature nor is it especially fierce. Rather if you held a race in Nice and wanted a mountain time trial then you’d pick this road and it’s rightly famous as the decisive place for Paris-Nice, the ascent is the coronation of the champion. But it’s still special for the way it lets the rider go from city to woodland in the time… well that’s up to you, it depends how quickly you climb the first 2.5km at 8%. As the road does not lead anywhere except for the village it’s a quieter place than other roads in the area. Riding is different to racing. For a race it’s all about pacing, to go full speed for the 20 minutes requires intelligent riding to master the frequent but subtle changes in gradient, to known when to change down a gear and crucially when to change back up. Seconds can be won in the corners by taking the right line and, because the road twists a lot, coping with different wind direction. The city of Nice is very close and its airport offers connections to Europe and beyond. There are places to stay on the climb itself including hotels in Eze. You can ride all year but it’s busy in July and August. But if you had to choose a week, now is the time. With Paris-Nice here and Milan-Sanremo a week away, the area is the focus of pro cycling for the next week. Spring is here and normally the weather is good. Next week, to coincide with the Milan-Sanremo race in Italy, the crucial Poggio climb. Like the Col d’Eze, it’s a road that’s both made famous by cycling and offers good views of the coastline and sea below. More roads to ride at inrng.com/roads. Eze sign photo via flickr/johanseland, village view via flickr/jimmyg. Rode it today! No great views but always a good ride and a nice gauge of form. For me you have to ease off at the start to have the fresh legs for the second half. Start fast and you will slow at the point when you must push the bigger gear. A great winter/ spring climb. Even get the two within a few minutes, as around the back of Mont Gros it can feel wintry, but later in the sun looking down at the sea and Cap Ferrat it’ll be 10 degrees warmer. The changes in gradient can be quite sharp (at least for a slowcoach like me) – sharper than it appears on the graphic of the climb in today’s Spin. They must occur mid-kilometre. For the descent, I find this road too full of side roads and garage run-offs, especially at the bottom. No fun, even a bit, you know, ‘dangerous’. I prefer to take the main road. Despite the extra traffic, it’s full of wide sweeping curves and dual carriageway sections. And more of that sea-view! Hi, I’ll be there in Sep for the first time. Which do you think is the safest route back to Nice after the climb up? Look for the Moyenne Corniche to your right and you can head back easily. For a quiter route, carry on up to La Turbie and turn left in the village, this will take you back round the back on a quiet road. Seconded. The right turn just before La Turbie which takes you to the Moyenne Corniche as it reaches Eze Village is a happy medium. Fast, but open, and not a hanging-on-the-brakes affair. Don’t turn right immediately at the Col, to get down to Eze Village – that’s a near-vertical road!